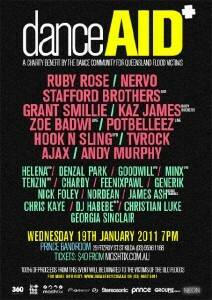 The cream of the Australian dance community will unite in Melbourne next week for an exclusive one-off event, all in the name of fundraising for the victims of the Queensland floods. NERVO is in town for the event, so too is Ruby Rose, Grant Smillie, Stafford Brothers, Kaz James, Zoe Badwi, Potbelleez, TV Rock and many more. Organiser Grant Smillie is understandably excited about the chance to do his part. 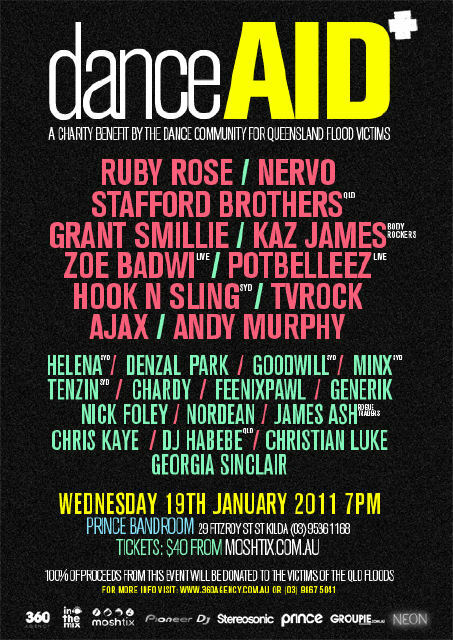 It’s a who’s who of Australian dance and best of all, 100% of the proceeds from the event will go straight to Queensland flood victims. Tickets for the event are on sale now and you can grab them HERE.